Can daily juicing with superfoods change your life? 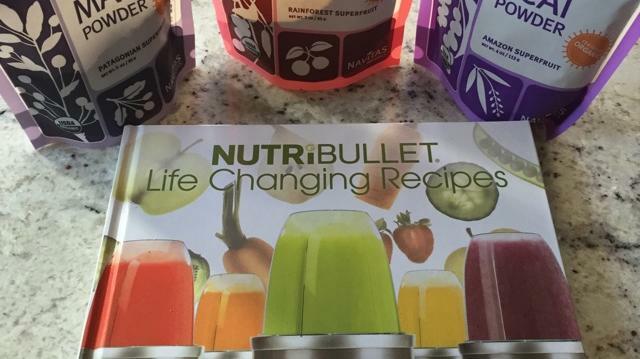 So claims the cookbook that came with my new blender and the powdered supplements in my pantry. Who: Erika Ehmsen, Managing Editor of Sunset’s Digital Editions (for your iPad, Android, etc.). This year, I’m determined to: Hop on the juicing bandwagon. And to pack superfoods like spinach and goji berries into each freshly blended fruit-and-veggie concoction. I chose this because: I need to kick my bar habit. Not my nighttime one. My daily intake of a gooey, nutty, chocolate-glazed breakfast bar. Yes, daily. I’ve been feeling rundown and was recently diagnosed with vitamin D and iron deficiencies, so I clearly need to change up my diet, starting with my breakfast routine. My biggest obstacle: Time is not on my side. On weekday mornings, my new juicing habit may be doomed if I don’t chop and measure all ingredients the night before. My biggest temptation to cheat: I have a whole drawer full of KIND bars, which pack some protein, resemble real food, and don’t require any prep work. Coping mechanisms: Friends who know what they’re doing. I’m leaning on coworkers who don’t count calories yet swear by their NutriBullets (I just bought one, basically for the convenience of blending in a to-go cup) plus my super-crunchy friend in Portland who is on a superfood-smoothies kick. I’m feeling: Exhausted and unprepared, having started this new habit on New Year’s Day after a sangria-fueled New Year’s Eve spent dancing in that other kind of bar. (Wince.) I didn’t crack open any juicing cookbooks ahead of time, and I don’t have any raw spinach or other leafy greens (which most new-age juicing recipes call for). At least I have a juicer and some browning bananas on my counter. And a pantry with honey, dates, raw almonds, coconut water … and chia, goji berries, and cacao beans (don’t laugh; these were post-Portland-visit superfood-indoctrination purchases). Put all ingredients into a blender (a Large cup if you’re using a NutriBullet). Pulse for 45 seconds, then check to make sure dates and goji berries have been fully puréed (pulse a bit longer if they are still chunky). Follow me on Twitter @esquared415 and Instagram @esquared415. And please share your favorite veggie/fruit juice combos (really—I could use your help) by tagging your posts with #SunsetEatFresh on FB/Twitter/Insta.